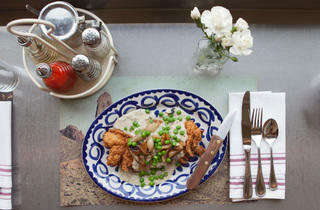 Photograph: Martha WilliamsChicken fried chicken at Dove's Luncheonette. 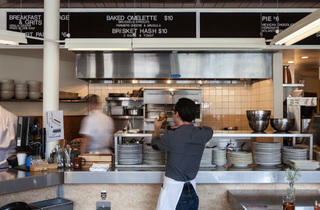 Photograph: Martha WilliamsVuelve a la Vida at Dove's Luncheonette. Photograph: Martha WilliamsChuleta de puerco at Dove's Luncheonette. 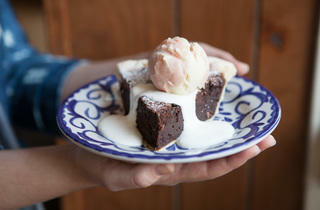 Photograph: Martha WilliamsPie & Guava creamsicle ice cream at Dove's Luncheonette. Photograph: Martha WilliamsMezcal shot with sangrita back at Dove's Luncheonette. 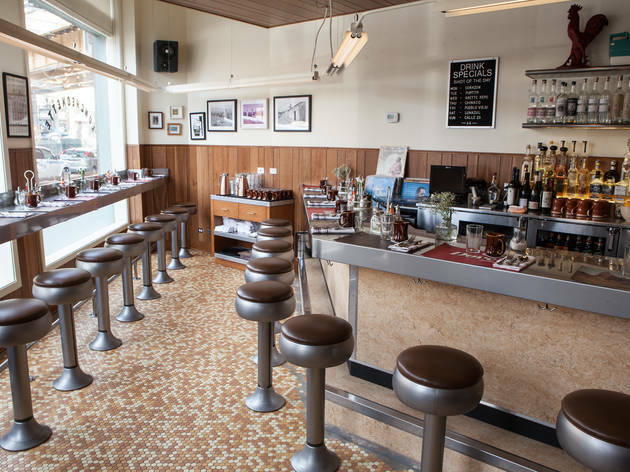 The morning after attending a rather boozy party, two friends and I slumped over the counter at Dove’s Luncheonette, hoping that a hefty serving of diner food would cure us. 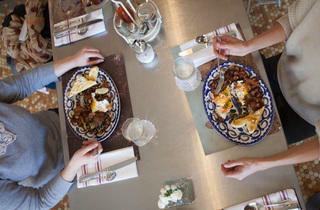 Dove’s isn’t your typical diner, though, so we wouldn’t be getting a greasy plate of overcooked bacon and rubbery eggs. 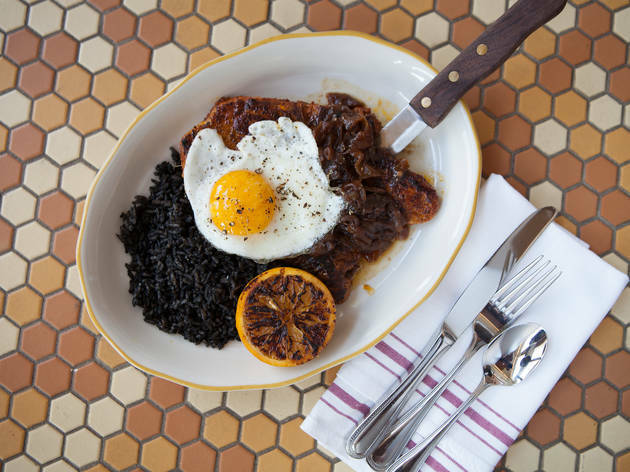 No, we’d be eating blood sausage and drinking Bloody Marys, as Dove’s is the latest entrant into the nouveau diner landscape, which is already populated by Little Goat Diner and Au Cheval. 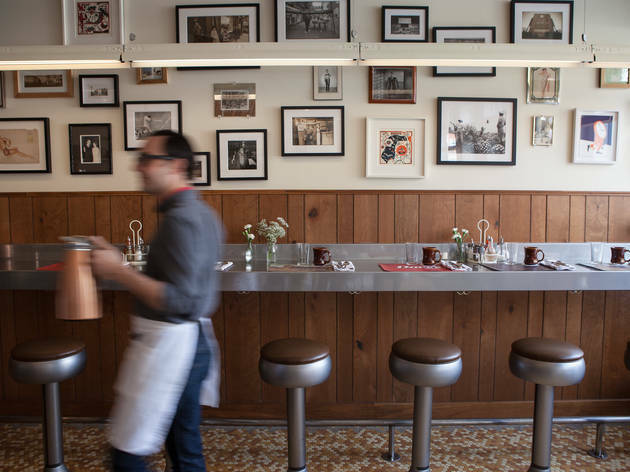 But neither of them really feels like an old-school diner—Au Cheval is dark and glamorous, like all Brendan Sodikoff restaurants, and Little Goat is a loud family restaurant serving foot-tall goat burgers. But Dove’s has the spirit of one. The latest spot from One Off Hospitality (Publican, Avec and others), Dove’s is located next door to One Off’s Big Star and it shares a building with the relocated taco take-out window. 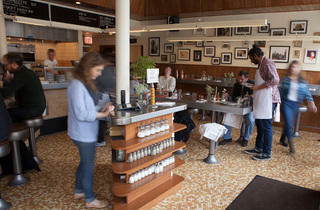 The only seating option is padded stools placed along steel counters, which line the perimeter of the cozy restaurant. It’s open from 9 in the morning to 10 or 11 at night. There’s a black and white board listing breakfast and dessert specials and a record player spinning in the corner, with a jukebox to come. There are big windows overlooking the CTA construction on Damen Avenue, retro photos on the walls and counters set with paper placemats printed with pictures of mountains. The menu, which features Norteño cuisine (that's food from northern Mexico), is short and approachable, and it’s being executed by chef de cuisine Dennis Bernard (the Publican). This is the kind of place you can have breakfast before work and demolish a plate of enchiladas after a couple of rounds at the Violet Hour across the street. 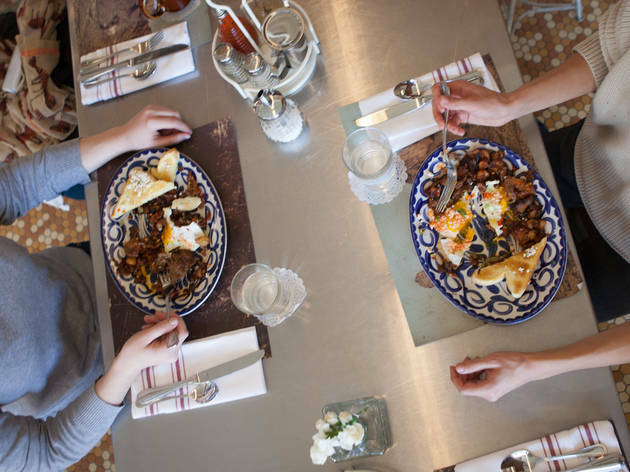 In short, it’s a diner, just one that’s been freshened up and thoughtfully designed and serves much better food than we’ve come to expect from diners. At breakfast, I immediately ordered a Bloody Mary and an iced coffee on draft, which was dispensed into a mason jar. The coffee is a house blend from Dark Matter, so it’s excellent, while the Bloody Mary, with CH Distillery vodka and a hefty hit of smoked black pepper, is so thick it’s almost chewable. While these were enough to make me feel better after having too many Half Acre Heyokas the night before, the breakfast specials, which are available until 2pm, didn’t hurt either. 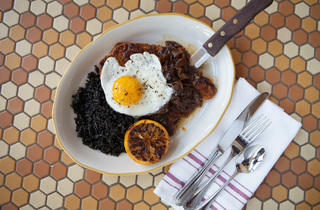 The grits and blood sausage (a thick, rich specimen that uses the same recipe as Publican Quality Meats) is a worthy order—there’s also sweet caramelized onions, a fried egg and queso fresco, plus Texas toast to wipe the whole plate up. Ditto the hash, a big plate of brisket, potatoes, fried eggs and toast. Cover the whole thing with a slug of housemade hot sauce and you’ve got a hell of a start to the day. Breakfast isn’t available all day (change that, please! One of the greatest joys in life is an all-day breakfast menu), but several dishes come with eggs or, for a $1, you can add one on. The tamale sits atop scrambled eggs with roasted delicata squash, tomatoes, onions, a scoop of lime cream and a fistful of cilantro. It’s a hearty breakfast or a lighter dinner. 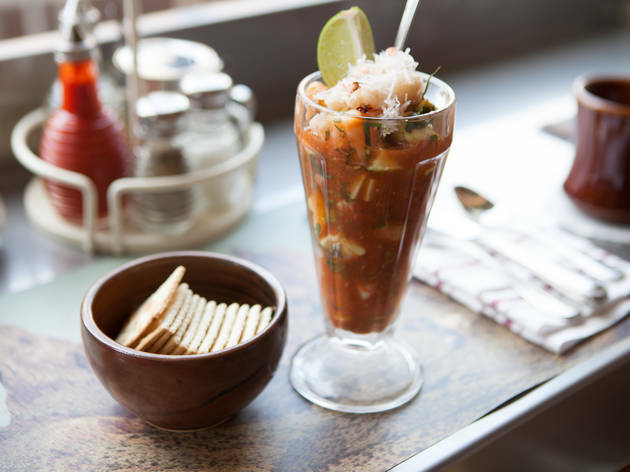 The vuelve a la vida, a hangover cure that means “back to life,” is one of my favorite things here—shrimp and squid ceviche are served in a sundae glass and capped with fluffy crabmeat. The seafood was the perfect texture and the broth (orange and lime juices with tomatoes, habaneros and avocado), was spicy and bright. It’s also a nice, easy starter when entrees, such as the chicken-fried chicken (two pieces of chicken with heavy, crisp coating doused with chorizo verde gravy and lightened with peas and green beans) and the red chile enchiladas (three corn tortillas packed with shredded chicken thigh meat, and covered with a deeply flavored guajillo-ancho chile sauce, a thick blanket of melted cheeses, cilantro and pickled chiles) are substantial dishes. 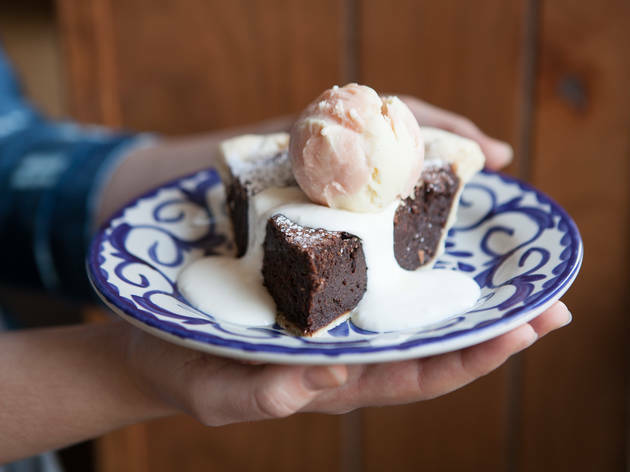 You won’t find these dishes at, say, the Diner Grill, but desserts are diner classics taken up a notch—Hoosier Mama is making the pies and the rotating list includes a creamy horchata slice and a Mexican chocolate chess pie, which is fudge-like with a crackly top. Blackbird pastry chef Dana Cree is doing the ice creams, including a Mexican chocolate sorbet and guava creamsicle, a swirl of creamy and fruity flavors. You won’t go wrong with anything on the sweet side. Most diners don’t have booze, but Dove’s does, and while sibling Big Star has a large whiskey collection, Dove’s focuses on tequila. Ben Fasman manages the bar program and he has a list of tequilas and mezcals that runs 70-deep, making this a haven for agave spirit fans. 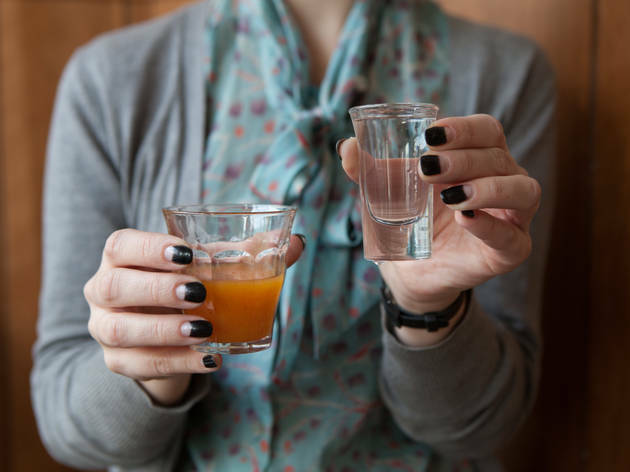 If you prefer your tequila in a cocktail, there are a few cocktails available, including the pleasant and refreshing tequila cobbler, which includes blackberry, citrus and Cocchi Americano. 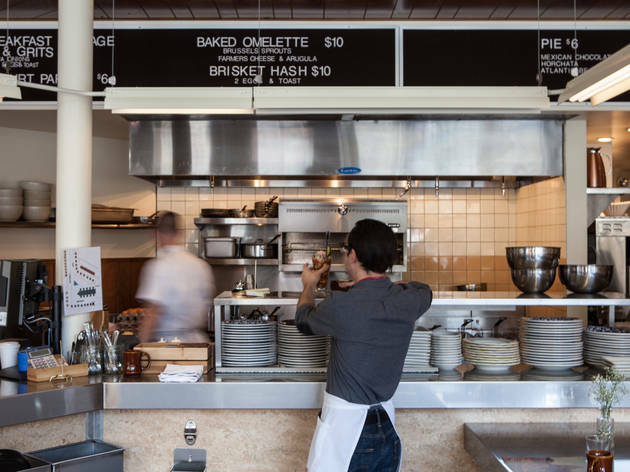 There will always be a place for the gritty 24-hour diners sprinkled around town. But Dove’s, with its perfectly executed menu, cool vibe and tequila list, proves there’s a place for a nouveau Mexican diner, too. Dove's is a trendy little spot just south of the 6 corners intersection in Wicker Park. 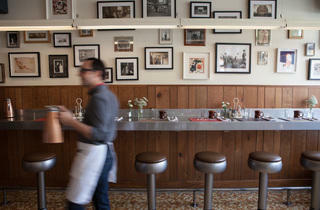 Modeled after an old lunch counter the menu is anything but plain old diner food. 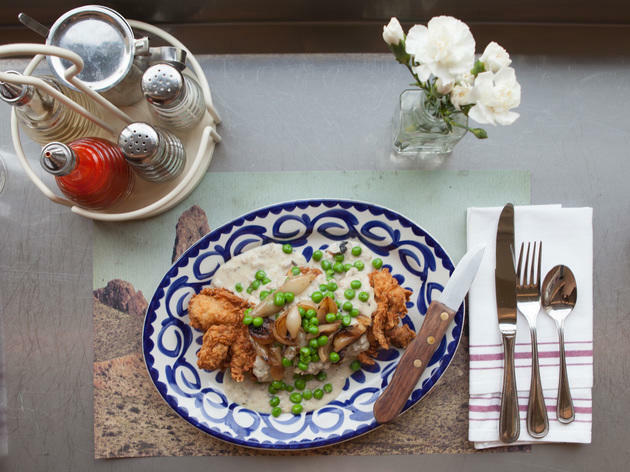 A southern menu with a Tex Mex flair made for a perfect lunch with girlfriends! Between the three of us I was able to try one of their incredibly fresh ceviches, the burnt ends hash, a few bites of their grits, their breakfast tacos, and some french silk pie. Their drink menu is trendy with an emphasis on mezcal and tequila and the old vinyls playing only add to the kitschy ambience. Nothing I tasted was bad, in fact their hash may have been the best I've had. If nothing else, get an order of their crispy breakfast potatoes and your life will be complete! 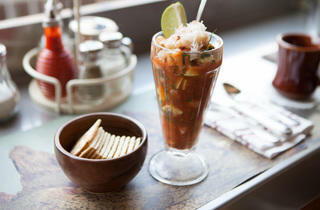 A trendy spot that is actually worth the wait- Dove's has amazing food, friendly staff and a trendy, loud weekend vibe. The burnt ends hash is my favorite but I'm sure you can't go wrong with anything on the menu. 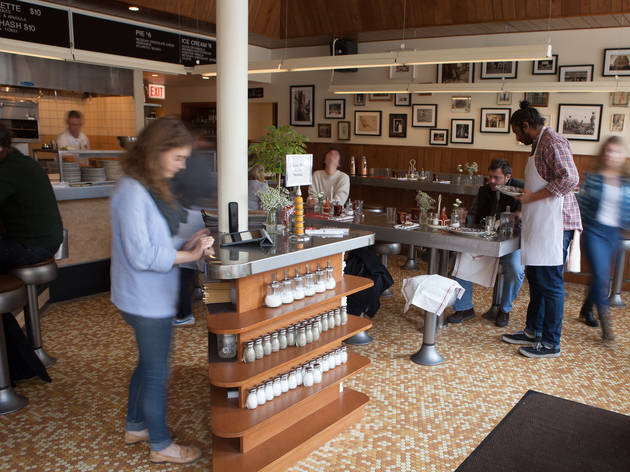 While you wait, explore the neighboring coffee shops and murals. They'll text you when they're ready! With an adventurous menu right in the heart of Wicker Park, it's only reasonable the Dove's gets all the attention it does. The sweet potato enchiladas are incredible! Best breakfast in the area. 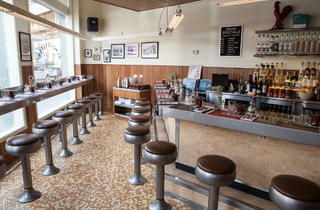 Looking from the outside, you would never expect this retro diner to have some of the best Mexican food in the city. I hate to use words like "simple" and "fresh" but I don't know how else to describe it. The menu has options for everyone, whether you're looking for something light like the pozole or something to put you in a food coma like the brisket tacos. I actually went with the daily special which was a Chorizo burger. The right amount of spice and cooked to perfection. I also had a side of the grits then went perfectly with the Shiner Bock I was drinking. The place is small so expect a wait but I promise that it's worth it. This is the best execution of a diner to pop up on the scene in quite some time. Everything we tried was delicious, but the brisket hash stole the show in my book. Snag a stool at the window for some great people watching while you eat. A friend of mine brought me here for a late brunch during the week. The place was super lively and exactly what I needed to pick me up and my appetite after a hectic morning. The menu is filled with great unique lunch options that make it difficult to choose. Each plate that was brought out looked incredible. I ended up ordering the Enchilada De Cochinillo for lunch and it was delicious!